I’m still not quite happy with the blog theme but I’ll get there eventually. At least this one doesn’t have a massive picture on the top (header images aren’t really my thing, as I’m terrible at them). This week was a bit better than last week. I think I might be coming out of this blehness, though I still don’t know what caused it. I spent a lot of time trying to sleep or looking at cute pictures/reading rubbish on Reddit. The best parts of the week were having my top changed and a wipe wash with Johan on Wednesday, and having my hair washed with a shampoo cap on Saturday. It was nice to feel cleaner. I also remembered I liked marmalade so had that on toast a few times for lunch, and our favourite pasta restaurant was delivering here again so we got nommy fuds from there on Thursday evening (I love the tagliatelle carbonara and the white chocolate cheesecake). I was asleep for quite a few of the care calls, but by the end of the week I could tolerate the carers being in my room again. Other than a few changes I wasn’t told about (which made me very anxious and panicky) my mood was good. Johan decided to run to Crawcrook for pizza on Tuesday. He says the pizza, chips and sauce are all just as good as he remembered. I’m a little bit jealous but Crawcrook is a tad far for me to go at the moment. Getting pizza home would also be interesting as it takes nearly an hour on the bus, taxis are expensive and Johan can’t exactly run that far while carrying a pizza. Saturday I was feeling up to watching things again so I resubscribed to Netflix, as they were offering me another free trial. Watched Nailed It with Johan and it was hilarious. Sal should just never touch a microwave. We had McDonalds as we’d not done a shop since the middle of February so didn’t have much in. It was an awesome day and I hope we can watch more together. Sunday I had a bit of payback from watching Netflix so didn’t do much. Still felt nowhere near as bad as I did the week before which I’m very grateful for. Hopefully whatever caused that is now gone and I can concentrate on getting up and doing things soon. Johan hugs – Not yet. Soon? Digestive system was bad but not quite as much as the week before. I wish I didn’t find unexpected change so hard. It’s worse when I can’t use my usual coping mechanisms as too ill to move. Johan made me laugh so hard I couldn’t breathe. Unfortunately I’ve forgotten what it was about. So is Sammie. And Johan. Didn’t play games at all Tuesday or Wednesday as wasn’t feeling up to it. Got a Gold Trophy in the Animal Crossing fishing tournament. Second part of the Mario Event started, and I got every item available other than the leaf ticket one. Four more animals were added, and I’ve invited them all to my camp. Elite rift dragons in Dragonvale are annoying. So many fails. I keep missing Hermeowne in Neko Atsume. I only need her memento to have a complete catbook. We got a lot of snow this week. I got my curtain pulled back so I could watch it falling, and it was very pretty. I had forgotten that my body really doesn’t like the weather changing, so I’ve been extra fatigued and hurty all week. 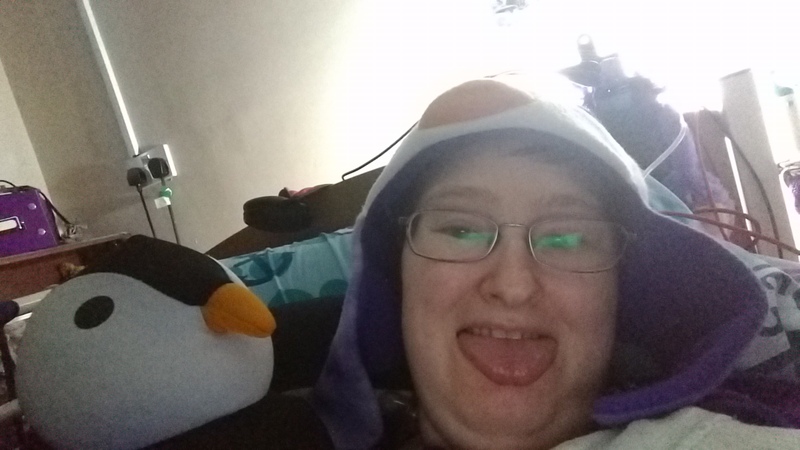 I was glad to stay in bed with my heated blanket and penguins. 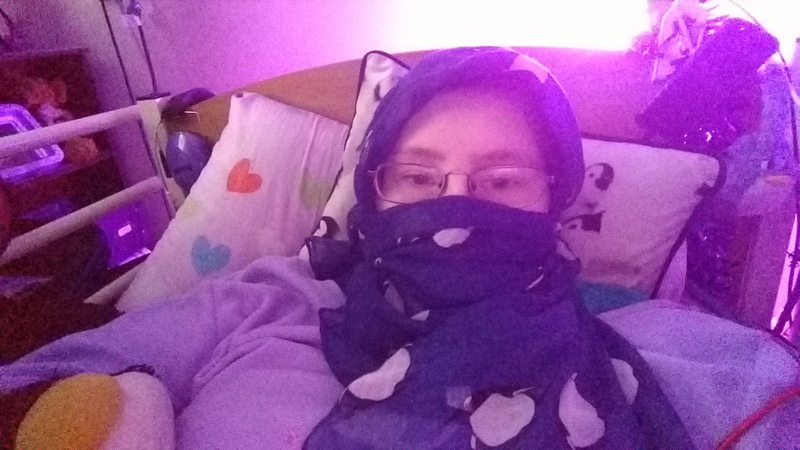 Photo is from Sunday, where I was feeling bleh so covered my head with my scarf. It helped a bit. Wednesday wasn’t good. Not only did the wrong care worker come for my lunchtime call, she was 40 minutes early and I hadn’t been told it had changed. It took me years to be okay with the expected care worker being 15 minutes early, so this was too much. Ended up having a meltdown which was not good. She was also calling me lovey and honey which I hate even on a good day. One of the better care workers contacted the agency for me and told them I really need to be informed of all changes and that I didn’t want that particular care worker again. Afterwards I was really drained, but Sammie sent me pictures of a snow cat I asked her to make and I found an easier method to watch the Edinburgh Zoo penguin cam so I was okay again in the end, though it made me even more tired for a few days, and definitely ruined any chance of getting out off bed. Still been trying to catch up with YouTube now I’m able to watch it, in between sleeping. Johan decided to go into Newcastle as normal because routine is good, and even went running in the snow a couple of times, once at night, because he’s silly. During the early hours of Sunday morning I had a rather bad accident requiring a wash and bedding change among other things, and I’ve needed more help than normal in general so Johan really earned his £62.70. My first increased PIP payment came in so I actually feel it’s real now. I bought a new purple Trabasack as despite having several they keep going missing when I need them. This one has a wipe clean surface so will be better for meals than the ones with the velcro top. I just need to figure out the best place to keep it so it doesn’t go missing and people can grab it when I need it. Next week I’m hoping my body will get back to normal, and overall things will be calmer. I especially hope I need less middle of the night changes (maybe I’ll even sleep at night!). There’s another flower event in Animal Crossing. This one involves catching ladybirds. I have the same problem as I normally do of people sharing lots of ladybirds with me but I’m not able up to share them all back as there are too many people. I completed the first part of the event. I’m not sure if I’ll be able to complete the second part without using leaf tickets (premium currency) but waiting until the last day to be sure. I have added a new part to my spreadsheet to track ladybirds. I wish I could remember how to use conditional formatting and better formulas. My Godville Heroine is 1 year old! Definitely the best game when I’m not well. Last week was mixed. Some good stuff (going on the Surface and video chatting to Sammie, making a hexahexaflexagon) and some bad stuff (waking up to a strange care worker in my room when I’d been expecting a regular one and had no notice of the change, digestive system being so evil I couldn’t be touched by the care workers during a call as was in too much pain). The big news was I got my new PIP letter and the back payment of everything they owed me for the last year. I gave some to Johan as a Christmas/birthday present, cleared half of my credit card (0% interest so no point in clearing it all right now) and put half into savings. With the remainder, I bought a Nintendo Switch, some cool t-shirts and stickers, some disability stuff I’d been putting off and bought a celebration takeaway from Portofino in Newcastle, which was the best pasta I’ve ever had (tagliatelle carbonara). I still have some sitting in my bank account that I’m sure I’ll find a good use for. I have started work on trying to fix my blog. I’m not happy with the theme or the header image yet, but at least it’s not throwing up errors now. I need to figure out getting the accessibility buttons to work properly as well. It’s too difficult to do from my tablet so it’ll be done in bits when I’m on the Surface or my puter. I was finally well enough to catch up properly on some of my YouTube subscriptions, the ones without too much movement in the videos. I’ve got 3 months worth of videos to catch up with, so far managing three channels. I also rediscovered Vi Hart and made a hexahexaflexagon, which was an awesome stim toy until I ripped it. I need Johan to cut me out another template so I can make a new one. I want a cloth flexagon of some type, but I can’t find any premade online so might need to find a crafty person to make me one. I’ve started clearing out my chest of drawers, throwing away anything damaged and putting stuff I can’t wear into a vacuum bag. The plan is to reorganise my drawers so the most used clothes (tops and nighties) are most accessible. I do need to get the cleaner to stop piling stuff around it so we can get into the drawers. I’m looking into finding someone to help me organise my bedroom, as though the cleaner is excellent at cleaning and okay at tidying, she is not good at organising or using space efficiently. It’ll probably take an organised person an hour or two to sort in total, but it’s finding that person. I did have a care worker who was excellent at it so I was going to ask her, but she’s injured and I don’t know when or if she’ll be back at work. This week we’re expecting a lot of snow. Since that means I can’t go out, I’m hoping if well enough to do something nice indoors, or even have a shower. We’ll see if my body agrees. 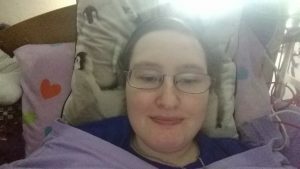 PIP award letter and back payment came through! Discovered the joys of flexagons, and how awesome hexahexaflexagon is to say. Johan accidently dyed the washing purple. 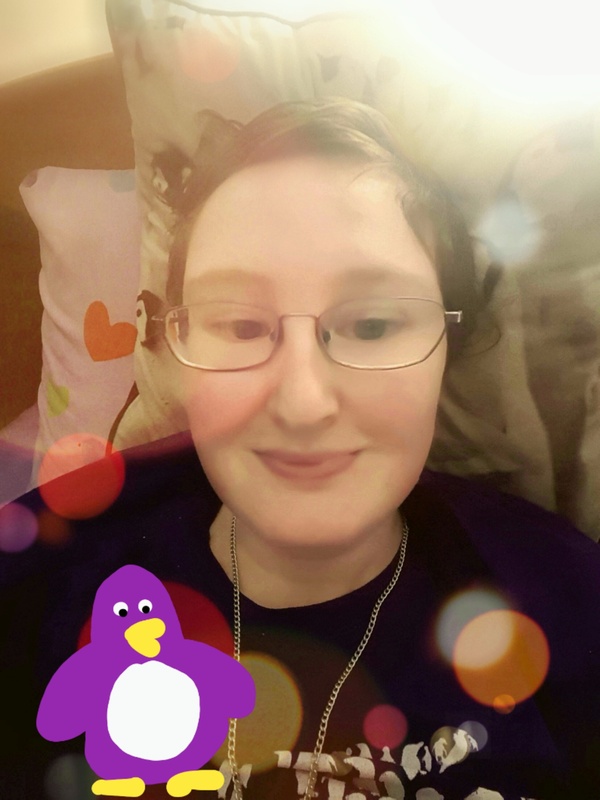 I now have purple penguin pillowcases. DragonVale event has finished, so am now taking a break. Animal Crossing has finished the crystal event. I finished getting all the blue tulip items in Animal Crossing so now I’m concentrating on purple tulips. I’ve yet to really try the Switch (have slept a lot since buying it) but I’m hoping to be able to play on it. If not, Johan will have to play for me. I think I’m going to change the day for these posts to Monday, so I get the full week’s data. Picture is of me the morning of my PIP tribunal. I’m still happy we won, just annoyed I had to go as we gave enough evidence for them to make the correct decision in the first place. I now have payback from that so feel rather rotten, but it was expected and we prepared so it’s not as bad as it could be. Tomorrow I’m meant to be getting my flu jab (better late than never) which I’m not looking forward to but since flu is what triggered my ME I know how important it is. I’m wanting to watch the Olympics as soon as I’m well enough. I’m probably missing out lots of things but brain is very muddy. We won my PIP tribunal! I really don’t cope well with unexpected change during payback. Panicked over different carers twice, even when Johan was here. If I’d been told it would have been okay. 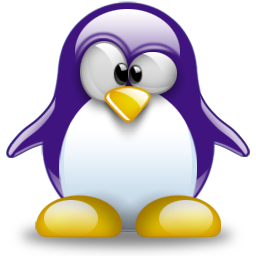 I need to change the theme on this blog as this one no longer works properly. I need to be on the Surface or my computer for that though. Finished catching all the bats needed a day before the end of the event in Animal Crossing. It was much easier than the last one. Now there’s no event I’m only playing a couple of times a day. Currently working on getting blue tulips and levelling animals. Now have 8 animals at level 20. I’ve been levelling up the Hip amenities. Now on the first tier 3 amenity, after which I can go back to the others I need to level. TL;DR: Got enhanced daily living, enhanced mobility PIP until December 2020. We won. Today was not the nicest day for travel, being cold and snowing. Hot water bottle and hand warmer were much needed, along with winter weather stuff. Got there 15 minutes early, which is good going for us, especially as Johan had to push me (the hardest bit being unavoidable no matter how we travelled). When we arrived they were reviewing the evidence, which Johan had read and I kinda knew the existence of (being too ill to read most of it myself). Got called in not long after. The tribunal itself went fine. They asked that I answered the questions if possible, but Johan could take over if needed and was given time to add to my answers. They were only concentrating on a couple of descriptors as we provided so much evidence. Some questioning about my DLA history as that wasn’t provided by the DWP (and Johan didn’t know it all as some was before he knew me). Mostly questions on mobility and using my shower chair/washing. I was struggling near the end but they asked Johan to add anything he wanted and then we were asked to leave while they discussed it (though I told Johan I was boaty and then had to describe what that meant for the record – dizzy and like everything is moving). The tribunal panel were nice and understanding, which probably helped me be able to contribute so much. During the wait I had my eye mask on while Johan was going on about how it was the hardest bit. Not long after we were called in and told the decision. Being told that they only changed the points in a few of the descriptors because they stopped at 12 was pretty awesome. I’m now on enhanced daily living and enhanced mobility, going from standard daily living and no mobility, so it’s a big change. My reassessment date is December 2020, which is fair enough as my condition has changed quite a bit in the last few years (mostly for the worse, but I’m optimistic that’ll it be better soon). Getting home was interesting. The snow was heavier and was sticking more, which is not ideal for wheelchairs. The hardest part was the ramp going from the street up to the ramp to the front door – it’s hard on a good day because it’s so steep, and with no grip it’s horrendous. I ended up helping to push to get through the worst of it, as without the wheels were just slipping and we were making no progress. I was scared we’d have to contact someone to help (no idea who), but between us we made it until Johan could manage by himself again. Once home, back in bed and mostly sorted, Johan read the tribunal report to me. A couple of the changed descriptors still aren’t entirely accurate, but I got enough points so don’t care. I’ll need to eat and calm down before I can rest as I’m running on adrenaline, but I’m very happy. I know I’m going to pay for today soon (especially the wheelchair pushing) but it was definitely worth it. It would have been much harder for me mentally to not be there, so worth any payback I get. Hopefully it’ll stop the nightmares that I’ll get it all taken away at least for a bit. We fought the DWP and we won.